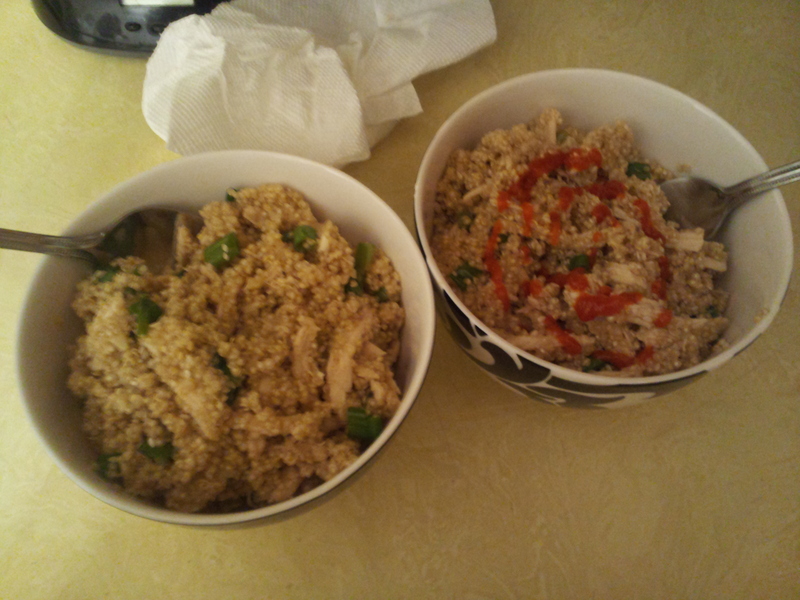 The one on the right is mine, with a little sriracha sauce to spice it up! -Heat a saucepan over medium heat and add 1/2 tablespoon of sesame and olive oil. Add in garlic and quinoa and stir to coat, then toast for 3-4 minutes, stirring occasionally. -Add in chicken stock and increase heat to high, bringing the quinoa to a boil. Reduce to a simmer and cover, cooking for 15 minutes, or until water is absorbed and quinoa can be fluffed with a fork. -Whisk together dressing ingredients and set aside. -Add in chicken, green onions and dressing, tossing well to coat. Add in sesame seeds and toss once more.